No, but seriously, what the hell is going on in Australian politics this week? I have to say, this is not how I had planned to return to my politics blog. But good God, Peter Dutton as Prime Minister? I mean, I don’t even know where to start with this. I’m torn between my personal revulsion and queasiness at the idea of someone who is this destructive and lacking in empathy as PM, and a certain awestruck astonishment at the sight of the Liberal Party apparently self-destructing before our eyes. I mean, we thought the ALP was self-destructive and stupid back in 2013, but this is looking less and less like a spill and more like an actual split in the party. I’m not going to attempt a lot of analysis here. I have been at home with a nasty cold all week, my eyes glued to the ABC News channel and to Twitter, and I’m not sure how much analysis I am capable of. But I feel like the situation is getting so convoluted that it’s worth trying to take a step back and write out the timeline. Also, I’m feeling bad for all my overseas friends whose timelines have suddenly been taken over by Australians expressing visceral horror about potatoes, or incomprehensible glee about Section 44. So this is going to be my attempt to disentangle the week’s events so far. I’m going to make it as complete as I can, but there is just SO MUCH going on that I am bound to miss something. And I’m fully aware that if this takes me two hours to write, I might miss a change of government, but hopefully this will not be too far out of date by the time I manage to post it. Also, there will be links to sarcastic commentary because this is frankly a horror story, and I, for one, need a little bit of humour to cope. And, after all, this whole situation would be genuinely hilarious, if it wasn’t the actual government of our country which affects actual people, and the punchline wasn’t the potential installation of a racist, conscienceless, cruelty-embracing, right-wing politician as our next Prime Minister. Now, this has all been brewing for a while, but I think I’ll start with Monday. Because God knows, there is enough that has happened since then to keep us all on the edges of our seats. But first, a little background. We don’t get to elect our Prime Minister. This is the first thing you need to know, because it explains a lot of the chaos of the last decade or so in our policies. Our Prime Minister is the leader of whichever party holds the majority in the House of Representatives (the Lower House). And if that party changes leader (through an internal leadership vote called a ‘spill’), then we get a new PM without any sort of election happening. In the Rudd-Gillard era, the ALP changed leaders twice because of a perception that Rudd, then Gillard, were unpopular and unelectable. Abbott got rolled by Turnbull when the Liberal Party thought the same about him. And the Nationals lost their party leader recently when he behaved like a total idiot and had to resign. The second thing you need to know is that the current government is a longstanding Coalition between the Liberal Party (centre right, heading further right with every passing minute) and the National Party (representing the interests of rural Australians, provided those rural interests have nothing to do with Climate Change). The Nationals are the smaller party, and normally follow where the Liberals lead. But… they don’t have to. This will become important later. The third thing that is relevant to this situation is that the current government has a majority of one seat. That means that if any member of the government should resign, die, or be found ineligible to sit in Parliament under Section 44 (a law that we in Australia have been learning a LOT about in the last year), there would need to be a by-election in that seat, and if the Coalition lost, they would also lose government. Also, if the ALP manages to have a vote when someone from the Coalition is in the bathroom or late to work, they can actually get stuff passed. Which happened in the first week of Turnbull’s new government. So things are a mite precarious. Turnbull announces that he cannot deliver the National Energy Guarantee (appropriately called ‘Neg’) because he lacks the requisite internal support to deliver it. This infuriates the Business Council of Australia, Australian Chamber of Commerce, the Investor Group on Climate Change, and many, many others, and also fails to appease the hard right of the Liberal Party. Which shouldn’t really come as a surprise to him, since nothing he does will appease the hard right of the Liberal Party. There are moves by the LNP (Queensland’s branch of the Coalition) to unseat Turnbull in favour of Peter Dutton. Scott Morrison, Julie Bishop, Matthias Cormann and others all declare that Turnbull is the leader of the Liberal Party and will take them to the next election. Dutton says he is fully supportive of the Prime Minister and the government’s policies. Everyone reports that Turnbull is definitely doomed. Meanwhile, there are reports that Dutton may be in breach of Section 44 and ineligible to sit in Parliament, due to his wife’s business receiving rather a lot of money as a result of changes to childcare provider legislation that Dutton supported. This causes great excitement in our household. There’s just one catch – he would need to be referred to the High Court by the Parliament, which is something that the Coalition don’t want to do, because Dutton holds his seat by a 2% margin, and the Coalition doesn’t want to risk losing their one-seat majority. Of course, Turnbull might see getting rid of his most dangerous rival as worth it… but that’s probably wishful thinking from this rabidly left-leaning household. Unless Turnbull wants to burn everything down on his way out the door? The expectation is that Dutton will challenge before the end of the week. Meanwhile in Parliament, we have this speech. Is it a good use of Parliamentary time? Probably not. Is it nonetheless the most entertaining thing I’ve seen in politics this week? Oh yes. Incidentally, Minister Greg Hunt is now being routinely referred to as Yorick. Anyone who likes puns and has a mental age of 12 knows exactly why this is hilarious. I feel certain that Shakespeare would approve. Turnbull calls a snap party room meeting, and a spill, hoping that Dutton won’t be ready yet and this will all go away for another month. But Dutton is ready, and nominates himself as leader. He doesn’t quite have the numbers yet, though, and Turnbull wins, 48 to 35, which is not the decisive margin that Turnbull might have hoped for. Turnbull claims that it is decisive anyway. He also very noticeably does not rule out the possibility of making another tilt at the leadership, avoiding the question eleven times. A number of his supporters announce their intention to resign from Ministerial positions, including Alan Tudge, Greg Hunt, Steve Ciobo, Angus Taylor, Michael Keenan, Concetta Fierravanti-Wells, Michael Sukkar, James McGrath and Zed Seselja. Turnbull accepts resignations only from Dutton and Fierravanti-Wells. He is really trying to present a unified front – all is forgotten and forgiven, and also, he can’t afford to lose that many ministers at once. And it isn’t long before several of these ministers change their minds about resigning anyway. Good times! Meanwhile, Nationals frontbencher Darren Chester says that he would not support a Dutton government or guarantee supply, and would instead join the cross-bench if Dutton became Liberal Party Leader. This would potentially take Australia straight to an election. Chester claims that at least three other Nationals from southern states would support him, but they aren’t speaking up. The Nationals leader, Michael McCormack, however, says that Liberal Party leadership is for the Liberal Party to decide, and the Nationals will not get involved. He says this with the smile of a man whose political party is not the one making headlines due to leadership issues this week. Adam Bandt confirms that he would NOT guarantee supply if Dutton were in charge. You didn’t need to tell us that, Adam. We already knew. The prevailing understanding, however, is that Turnbull is dead in the water and we will have a Dutton Prime Ministership by the end of the week. And someone is having fun on Wikipedia. There is no leadership challenge this morning. Newspapers are calling for an early election, on the grounds that this government is completely dysfunctional. But it’s not going to happen, because the Liberals aren’t ready for an election yet, not having finished their pre-selections. Also, there is concern that Turnbull would be rolled before he got to Government House. Labor, on the other hand, is ready for an election. Labor is very ready! Labor is positively champing at the bit! Also, Labor has obtained legal advice on Dutton’s situation vis a vis Section 44, because they are super helpful like that! They kindly release this information, which says that he is ineligible to sit in Parliament. It still doesn’t matter, though, because Turnbull is declining to refer the case to the High Court, and nobody else is going to do so without Turnbull’s backing. Though the ALP does try. They also release legal advice suggesting that Dutton is in breach of section 44, because they are helpful like that. Bill Shorten is having a lovely week! He may even be having more fun than Tony Abbott! Oh, and in terms of actual governing, the company tax cut is dropped, and the government says it will stop trying to repeal the energy supplement to low income earners. Dutton gives interviews everywhere talking about his excellent new policies. The ABC interviews people in Dutton’s electorate who are by and large not entirely sure who Dutton is and in some cases surprised to learn that he is their MP. In the afternoon we start hearing rumours that Dutton is circulating a petition for a leadership spill. If he can get 43 signatures, the spill has to happen. Varying reports suggest that the signatures number between 3 and 43. There are also reports that MPs – particularly female MPs – are feeling bullied into signing. Turnbull decides that perhaps he’d better get some advice on Peter Dutton and Section 44 from the Attorney General after all. Also, the former head of the Border Force says that he knows stuff about those two au pair visas and he is happy to share this knowledge. On Twitter, Labor MPs have been merrily re-tweeting everything that Turnbull ever said about the Rudd-Gillard-Rudd troubles, without commentary. No commentary is required. More resignations today. I’ve lost track, and I don’t want to go chasing them now because I’m pretty sure that the numbers will have changed before I press publish on this. Dutton now says that he also has legal advice on the Section 44 business, which, astonishingly, says that he is eligible and there is no case to answer. But discerning viewers note that this advice is dated before the change of legislation that brought his eligibility into question. 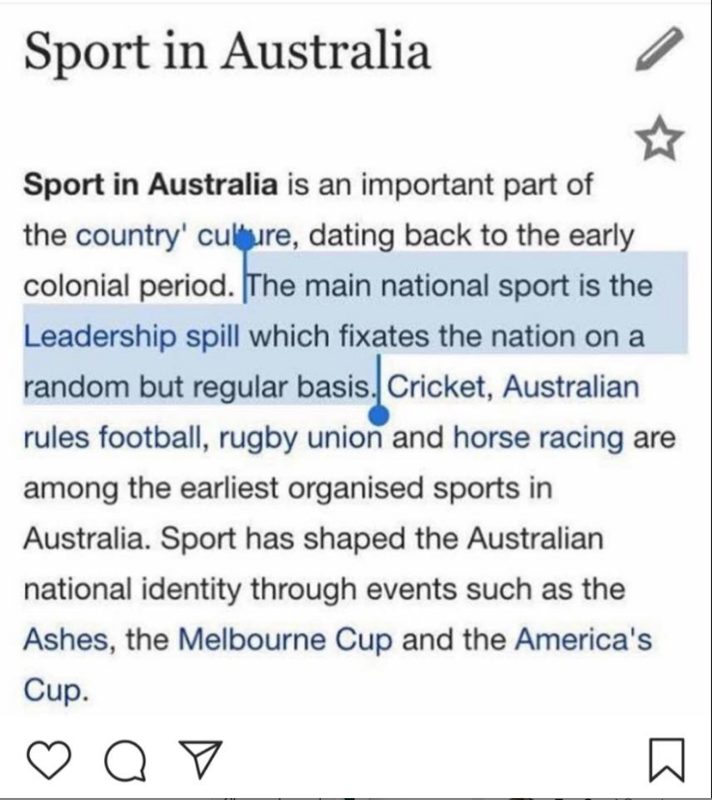 There is definitely a petition calling for a spill. But equally definitely, there aren’t enough signatures yet. The ALP then tries to move a no-confidence motion (not for the first time this week), but it fails, and the House of Reps goes into recess before Question Time, to the very vocal disgust of the ALP. Turnbull holds a press conference at 1pm, looking happier than I’ve seen him in ages. It’s the smile of a man who has nothing to lose. He says that there will be a party meeting at midday tomorrow, but there will not be a spill unless the petition has 43 signatures. Basically, he wants people to put it in writing that they are trying to roll the PM, and he knows that very few people want to do this. He is scathing about Dutton’s crew ‘bullying’ MPs into signing, too, as well as the attempts to drag the party further to the right. Apparently he has never given in to bullying, which is news to me. So he will, in fact, resign from his seat entirely, which, oh dear, will force a by-election and the possibility of the government losing its majority. Turnbull also points out that it’s really very important that Dutton’s eligibility is determined before he becomes Prime Minister. So very important. Really, we need to hear from the Attorney General. Because maybe Dutton isn’t eligible, and that would be a real problem, now wouldn’t it? It’s quite an impressive performance. Also a frustrating one. If he had shown this much spine as PM, we wouldn’t be in this situation now. The general commentary around this is that the goal is to make Dutton unelectable as leader, and make space for people on Turnbull’s side of the party to get the numbers – if they know Turnbull isn’t standing, then they can do this without disloyalty. Scott Morrison is the name most frequently mentioned, but in the mid-afternoon, Julie Bishop declares her candidacy. I’m rather hoping she will get in, to be honest, and I think she has a shot, despite being female in a party that is pretty sexist at the best of times. The electorate don’t hate her anywhere near as much as they do Abbott or Dutton, she’s moderate enough to look good to the centrist liberals, and most of all… it’s traditional to put a woman in charge of the ship while it sinks. Which we can be pretty confident it will. I actually am finding myself thinking better of Bishop for standing for party leader. I don’t much like her politics, but this is hardly the point – I’m not going to like anyone the Liberal Party would anoint as leader, and I think she is the least disgraceful option available to us. But I’m inclined to think that she is, in this instance, inspired by patriotism and a desire not to let her party completely self-destruct. After all, she has never challenged before, and has always given the impression of really enjoying her role as Deputy PM and Foreign Minister. So I’m a little bit hopeful that she will be our next PM. Though I still think we need an election, stat. There is also speculation that Tony Abbott is going to run, and has merely been using Dutton as a stalking horse, which would be kind of brilliant, if true. Couldn’t happen to a more deserving potato. But that only stays funny if he fails. So Julie, we are counting on you. Meanwhile on Twitter, Australia has found another Peter Dutton, and would like to elect him. He sells popcorn. He seems to be a nice bloke. He’s American, but hey, we like dual citizens, right? Mate. It’s anyone’s game at the moment over here. Come try out for Prime Minister? Apologies for all the tweets you're receiving because of the political crisis here in Australia. Wishing you all the very best. PS: Will you be our PM? Please? And that’s where we are now. I feel like I should apologise for writing so frivolously. I don’t actually feel frivolous about this. I think Dutton would be a disaster for Australia, and Morrison would not be much better. They would, it seems all too clear, campaign on a race-baiting platform (I will be writing a post on the Sudanese Gang rubbish just as soon as this settles down), designed to appeal to all the worst instincts of Australians, and I think this would be tragic for our country. I’ve put my usual action suggestions at the bottom of this post, but first, here are a couple of other responses that I’d like to draw to your attention. Here’s an article by Andrew P Streetabout #libspill and why we can’t afford to be glib about it. And here is a video of Adam Bandt talking about what is at stake. It’s hard to listen to, but important. Because let’s not forget that Dutton is the man who has been overseeing our off-shore asylum seeker camps, where children and adults are abused, denied adequate medical treatment, and left without hope or a future for years on end. Is your local MP a Liberal? Call them tomorrow morning, or email them tonight, and let them know that you will never vote for a party that will elect Dutton as its head. Here’s a list of Liberal Party MPs and Senators – click through to find their contact details. Is your local MP a member of the Nationals or on the crossbench? Call them or email them, and encourage them to deny their support to a government led by Dutton (or, for that matter, Scott Morrison, who is really not a lot better). Are you in a blue ribbon Labor seat? Or a Green seat? That’s OK, because you can still call your State’s Senators! You know the drill. GetUp is running a campaign to stop Dutton, and looking for volunteers. You can sign up here. Behrouzi Boochani is a refugee and a journalist, who has been in detention on Manus Island since 2013. He has written a book, No Friend but the Mountains. This may not oppose Dutton directly, but it definitely opposes what he stands for, and I think that’s a good thing. Here’s a list of charities that support asylum seekers. You know what to do. ← Hugo awards 2018: The results are in! Great post and suggestions and super to read your thoughts on politics again! Your blog was my gateway into a deeper look at Australian politics and its fantastic to see you writing again, keep up the great work I’m looking forward to your next piece! I’ll be messaging my MP, the detestable Josh Frydenberg, to make sure he knows what I think about a Peter Dutton lead government. I think you may have left out Adam Bandt’s video. Thanks so much for your comment! It’s good to be back – I’ve had a hard time writing this year, but the prospect of Dutton as PM is certainly inspiration of a sort. And hopefully enough other people will contact Josh Frydenberg that he will choose wisely! I’m going to be contacting the Victorian senators myself – I’m in a very safe Labor seat, and my MP already knows my views on a range of issues…!